No doubt many of you have seen my TWSBI Mini Review. I’d promised a full review after I’d had a chance to live with the pen for a while. Well, this is it! Yes, I know that was in July and now its October. No need to remind me that this took 3 months! It was for good reason though. One of my complaints was with the leaky piston. I finally got the replacement piston seal a few weeks ago. I wanted to wait until the pen was functioning at 100% before I put up the review. I loved the very idea of this pen, so when I was finally able to get my grubby little paws on one I was ecstatic. I was impressed my everything about this pen from the packaging to the pen itself. I’m not the biggest fan of demonstrator pens, but the TWSBI changed that for me. Everything about this pen was well thought out from the design to the writing experience. Speedy and all those involved with TWSBI did a fabulous job on this pen. Two thumbs way way up here! This pen is gorgeous. 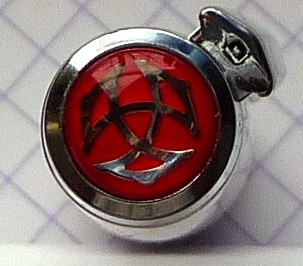 From the clear PC to the facets in the barrel to the red TWSBI emblem on the cap end. I can certainly see why this pen won a design award. This is one of the best looking modern fountain pen designs that was recently come on the market so far as I’m concerned. For anyone familiar with the Fountain Pen Network (FPN) you know that this pen was designed with input from the writing community. With every stage of designing this pen Speedy kept us up to date, asked for our opinions, and made changes accordingly (well as much as he could anyway). As you might also know from spending any amount of time at FPN we are in love with this pen. Then again, how could we not be? We helped design it. It’s kind of like getting a custom pen, except it’s a fraction of the price! TWSBI and gang are still making some changes to the design. Version 1.5 of the piston seal is now out. In the coming months we should expect the 530 to be available in many other colors. There should also be a solid black 530 down the line. Another fun aspect of this design is that it can be completely disassembled and reassembled by the user. The pen is shipped with a piston tool and a bottle of silicone grease. I can tell you from experience that it is very easy to take apart. But be forewarned, if you completely break the pen down you may have some problems getting it back together. Speedy has posted a YouTube video to help us with the reassembly. Study the video carefully. You’ll save yourself a lot of time. The Diamond 530 is a big pen. It is about the same size as the Pelikan m800. Really, it is. Even the dimensions are nearly identical. Also, the piston tool that comes with your TWSBI is said to be able to fit the m800 (I can’t confirm this). This pen feels substantial in the hand. It is 5 5/8” capped, 5 1/8” uncapped, and 6 7/8” posted. Yes, the cap does post securely, but be forewarned, it posts on to the piston knob. If you twist the cap as you are trying to pull it off the end of the pen you will actuate the piston. This may very well lead to an inky disaster. I personally, wouldn’t post this pen, but it’s up to you. Don’t say I didn’t warn you! I don’t post any of my pens unless they are too short to use without the cap on the other end. The cap on the Diamond 530 is pretty heavy. In my opinion, it throws the balance off if you post it. You be the judge. Some folks like their pens a little back-heavy. By the way, the Diamond 530 weights in at 27 grams inked. These pens, like almost every modern fountain pen on the market today, uses nibs and feeds sourced from Germany. There are only a few nib companies, and TWSBI has used Schmidt nib assemblies here. The 530 ships with a rather stiff stainless steel nib that comes in either XF, F, or M. There is a little spring in the nib if you try for it. It makes for a pleasant writing experience. There are other nib sizes in the works including gold nibs, titanium nibs, stubs, italics, and flexible nibs! I personally can’t wait to see what they put out. I chose a M nib for my pen, and I can’t be happier. When I first got it the nib was a little scratchy. These nibs do require a writing in period. My nib adjusted itself after I wrote out the first fill. It’s been perfect ever since. The main feature for this pen is its piston filling system. This pen takes bottled ink only. The first run had a bit of an issue with the pistons leaking. This was something that slipped past the quality control tests. Speedy sent out a statement about the problem and offered a solution for it before we even had a chance to complain. He also took responsibility for missing the issue and promised to fix it as quickly as he could. Thought it took a bit of time. The replacement piston seals are now out. They are referred to as version 1.5. Anyone who bought a first run TWSBI should have received one automatically. If you did not, you should contact TWSBI. Let me just say here that this is customer service at its finest. Normally you’d have to complain before a company even admitting that the problem was theirs not yours. TWSBI is a class outfit, and they’ve certainly earned my trust! Any TWSBI Diamond 530 you purchase from the ebay outlet or TWSBI direct will be shipped with a replacement 1.5 piston seal. I’ve installed my 1.5 and I can tell you that I haven’t had any leaking issues since. The piston on this pen functions flawlessly and smoothly. It’s every bit as smooth as Pelikans or Mont Blancs I’ve tried. 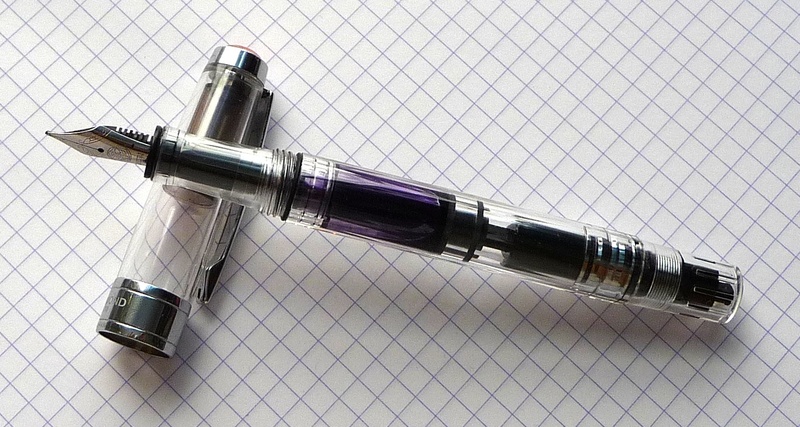 And again, the TWSBI is a fraction of the price. The TWSBI is $39.99 plus shipping. Now, let’s be clear here. For $40 you get a m800 sized piston filling demonstrator fountain pen with a decent nib. For $40 you get a pen you can completely disassemble on your own. For $40 you get a gorgeous pen from a company that stands behind its products. I honestly, don’t know how you get a better value on a brand new pen. I’ve used this pen almost everyday since I got it back in early July. I can say without a doubt that I LOVE this pen. I most definitely plan to get one of the other colors with some sort of fun nib. There’s a vacuum filler (plunger filler) on the horizon. I plan on getting that one too. Two thumps up for TWSBI. Keep up the great work. The twsbi was reverse-engineered from a broken Pelikan M800, so it’s not surprising how similar it is lol! No, really. There is a fine nibbed TWSBI 530 in there. I really love the idea behind this pen and I enjoy my fine TWSBI 530. I am much happier with the pen now that piston 1.5 is in the pen and there are no longer ink leaks around the seals. In fact, I recently picked up a second TWSBI with a medium nib. Like was mentioned, the nib is a touch rough at first and balance of the pen is odd when posted due to the cap being so massive. Because the cap posts on the piston knob, there is the issue of accidentally turning the knob when posting/unposting. So I have learned to not post my pen. It took a while to get used to, but now it is just habit and I enjoy the pen more (with the 1.5 seal). It looks amazingly similar to the Pelikan M205 clear demonstrator. Thanks for the review! I was reading about this pen last week and was contemplating getting one. Now the decision has been made. The more I read about this pen the more I think it is the next one…. I read your blog and decided to purchase this pen to replace my lost waterman phileas. Best decision ever! Thanks a lot! Mine arrived yesterday morning. The nib is…well, it writes. Period. the worst is that the section has started to develop cracks and I haven’t even dismantled the thing once. Save your money for a Pelikan or a Lamy. Hello. I just read your review and I seriously consider buying it. Have you used it in a Moleskine by any chance? I know this also depends on the ink that is being used. Nevertheless it would be good to get some feedback. Look fantastic, a modern, clean look. made just for using. Where can I find it. (buy it). Look like the Atelier Simoni with a new ink system. Thanks for all your awesome reviews. You convinced me to go with the Diamond 540 as my next FP (moving up from a Lamy Safari), but now I can’t get that Glenmont from your banner out of my head! That is Noodler’s North African Violet. No it did not stain, but it did require a more thorough cleaning of the pen to get all the residue out.